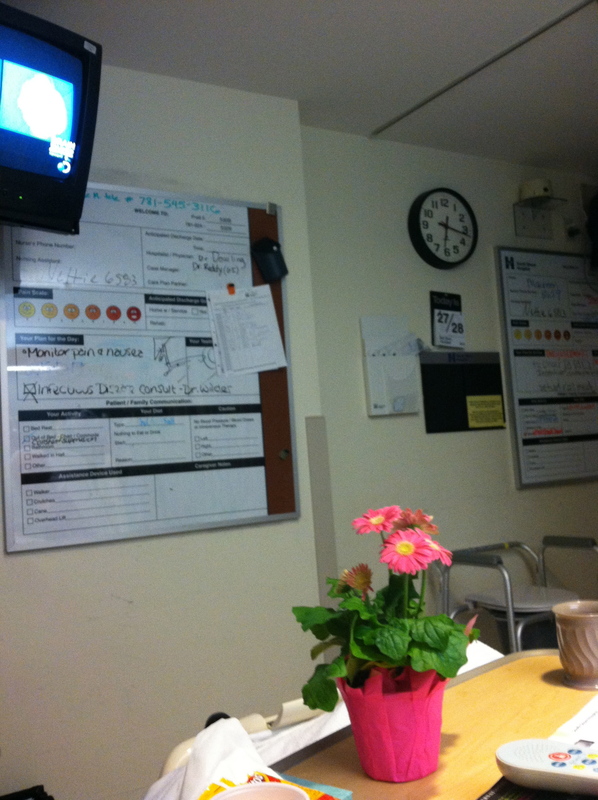 As Frankenstorm rides up the coast towards New England, I’m back in form, doing the Hospital Hang. My life has included mostly unexpected and sometimes extended hospital stays of people I love, and I developed my skills many years ago. They come in handy. How to do the hospital hang? Pack up food, reading, a computer (hospitals generally have strong and reliable wifi), work files and knitting. You may not use all the things you bring, but it makes me feel more settled to know I have plenty to do, in case I want to do something besides just be with the person I love who’s in the hospital. Once you arrive at the room of the person you’re hanging with, drag chairs from wherever you can find them so all the visitors can sit comfortably. Locate the mini-kitchen and get yourself some water. Find the closest restrooms. Chat with all the nurses and aides and be super-friendly. Marry a doctor and bring him along and smile while he lets the hospital staff know he’s a doctor and proceeds to ask knowledgable and important questions. It was David’s suggestion to test for Lyme disease, and my sister’s follow-up insistence on the test, that’s resulted in a diagnosis of my mother’s confusing symptoms — acute and chronic Lyme. Hopefully the IV antibiotics will start to turn around this multi-week roller coaster of pain and nausea, dehydration and confusion, appetite and energy loss. I’m hoping this hospital hang resolves quickly, for everyone’s sake. I don’t need any more practice. Okay, the “marry a doctor” part might not be that easy, but that’s a skill I picked up for other reasons, and it comes in really handy. Wishing your mom, and you, the best! Good to know what the problem is, and I’ll be thinking healing thoughts for her.